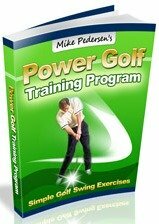 So you think it takes only a strong upper body to improve your golf game? Wrong! Lower body strengthening is extremely important to add to your golf strength training program! You also need a strong base in order to help improve stability and balance. A swing speed of 120 miles per hour means nothing if you are unable to keep your balance! The next time golf is on television, watch closely how balanced the top golfers in the world are. Rory McIlroy is a perfect example. He is in control of his swing at all times from back swing to follow through. It all comes from a good mix of core, upper body and lower body strengthening. For proper balance, your first line of defense is the lower leg (everything below the knee). Your calf complex is the largest of these muscles but you have many lesser known muscles that will need to be targeted to improve lateral stability. The general terms for these muscles are inverters and everters. Inverters turn your foot towards the other foot, and everters turn your foot away from your other foot. This lateral stability that comes from these muscles is especially important for uneven lies! The largest muscle group of your lower leg is the gastroc-soleus complex. These two muscles combine to form your achilles tendon along with a much smaller muscle, the plantaris. During the golf swing, this group is important for pushing off and weight shifting. Moving up the chain, you will also need to strengthen much larger and stronger groups such as the quadriceps, hamstrings, and the various hip muscles. These muscles will further help stability but will also contribute to increasing torque as the club accelerates to make contact with the ball. In your stance, the main muscles in the lower extremities that are firing are your quadriceps and glutes. Getting these muscles strong is key for a solid stance! The quads and hamstrings extend and flex the knee respectively. They are important for maintaining a good golf stance, and also during weight shifting. The gluteal group (maximus, minimus, and medius) are one of the most important groups in your body during the golf swing. Strength here will contribute to a solid base throughout all phases of the golf swing. The exercises presented here will target these major muscle groups and help you on your quest to lower scores!